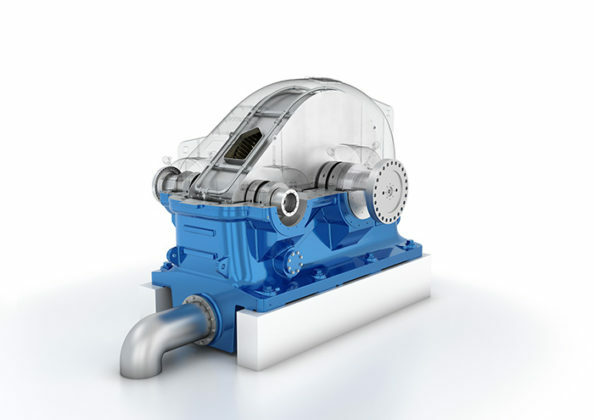 In the new BHS AeroMaXX solution for turbo parallel-shaft gears by Voith, the cooling oil flows separately from the lube oil in a special inner casing. 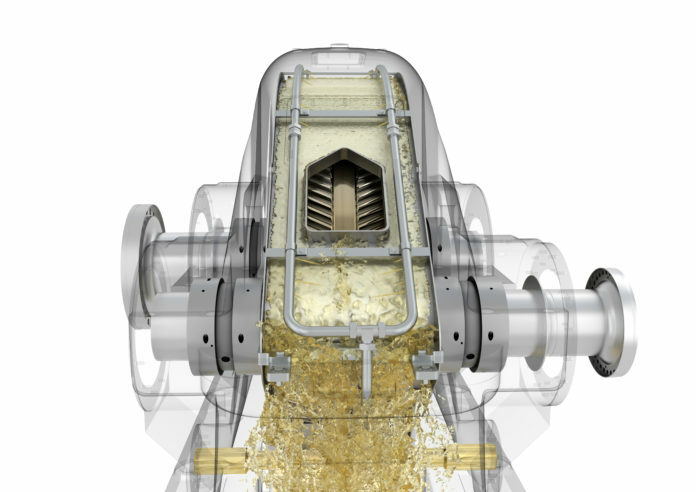 Voith’s BHS AeroMaXX solution for turbo parallel-shaft gears is reported to increase the efficiency of the gear by up to 0.5 percentage points and reduce oil consumption in the gear unit by more than 30%. The new technology is based on a special inner housing and optimized sleeve bearings. The high pitch line velocities in high-speed turbo gear units — up to 656 fps (200 m/s) — cause oil swirling and oil squeezing in the gear mesh, which account for a substantial part of the power loss in these units. With the BHS AeroMaXX technology, lubrication and cooling oil are separated and thus losses are reduced, together with the overall oil consumption. With this solution, a much smaller volume of oil is required for the actual lubrication of the teeth contact surfaces, and the swirling of the oil and air mixture is minimized. The passive mechanics of the system makes the BHS AeroMaXX a good option for retrofits. A test carried out by Voith on an 80,500 hp (60 MW) turbo gear between a gas turbine and generator in a power generation application showed a power loss with the BHS AeroMaXX of 630 hp (470 kW), against a standard power loss of 940 hp (700 kW). In terms of oil consumption, the test showed a consumption of 123 gal/min (560 L/min) with BHS AeroMaXX, in comparison with a standard 189 gal/min (860 L/min). In terms of oil flow, a reduction of 30% was reported, while the power saving indicated an increase in efficiency of 30%. Von Struensee-Binzer said that the BHS AeroMaXX solution has a passive-mechanical character and does not require any additional accessories. “The design standards of the turbo unit remain the same, as well as the overall operating behavior and the unit’s reliability,” she said. 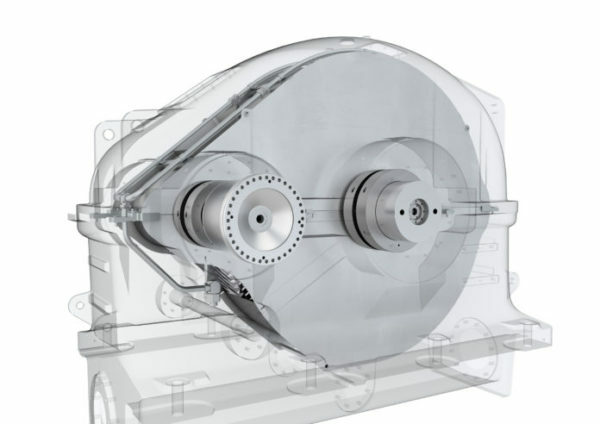 “For these reasons, the BHS AeroMaXX solution is also recommended for retrofit projects.” Voith offers a warranty period of 36 months for both new systems and retrofits, even when integrated into turbo gears of other manufacturers. BHS AeroMaXX is designed for high pitch line velocities in connection with medium- to high-powered drivelines. BHS AeroMaXX is designed for high pitch line velocities in connection with medium to high powers that occur, for example, in the driveline of power plants with compressors and generators. As far as maintenance and service of the gears with BHS AeroMaXX, von Struensee-Binzer said that an inspection window in the inner housing allows operators to continue checking the condition of the tooth set without opening the top portion of the gear housing.